Although MP4 is widely used and most supported by many devices, it's weird that some home DVD players, especially old ones, don't accept MP4 movies. If you have some wonderful MP4 files and want to save them forever or have difficulty in playing them on your DVD Player, the best way is to burn MP4 files to DVD. The following is a simple and easy-to-master guide which shows you how to convert your MP4 video to DVD to enjoy MP4 on DVD Players. Read on for details. Converting videos to DVD in good quality needs professional software, if you have been looking for the best MKV to DVD converter, EaseFab DVD Creator is there. This program allows converting an array of video and other formats in DVD like a pro. Just a few quick and simple steps and you are done. Using the program you can burn your MP4 and other files to DVD folder or ISO files in the local disk. Besides, there are a lot of options and editing choices you can make, turning your video into a professional, high-quality movie. No matter if you filmed your video on a cell phone, hand-held video camera or have still images you want to assemble into a DVD - these programs can help you put together the right features and output options to make it happen! Free download the trial version of MP4 to DVD Converter and follow the steps to burn DVD from an MP4 file quickly and easily. The steps to convert and burn MP4 files to DVD on PC (Windows 10 included) and Mac are almost the same, just make sure you get the right version of the DVD creator. Below we take MP4 to DVD Converter for Windows for example. Step 1: Open EaseFab MP4 to DVD converter and load MP4 files. Firstly, download and install EaseFab DVD Creator on your PC. Launch the software and click "Add Files" button to add MP4 files into the program. Please repeat the steps if you wish to add more files. 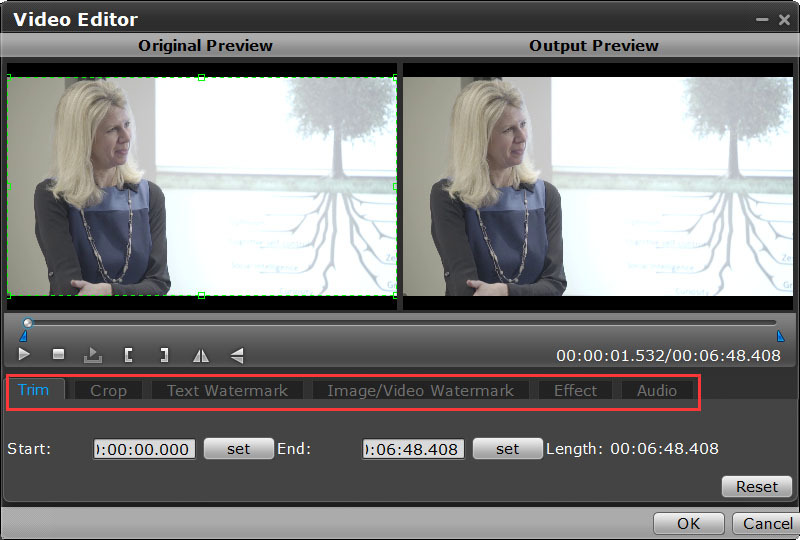 Step 2: Edit video with the built-in video editor (Optional). If you want to customize your MP4 files before burning it to DVD, you can click the 'Pencil' icon or highlight and then 'right-click' to access its editing options. In Video Editor, you can crop video, apply effects, add subtitles, add watermark and more. 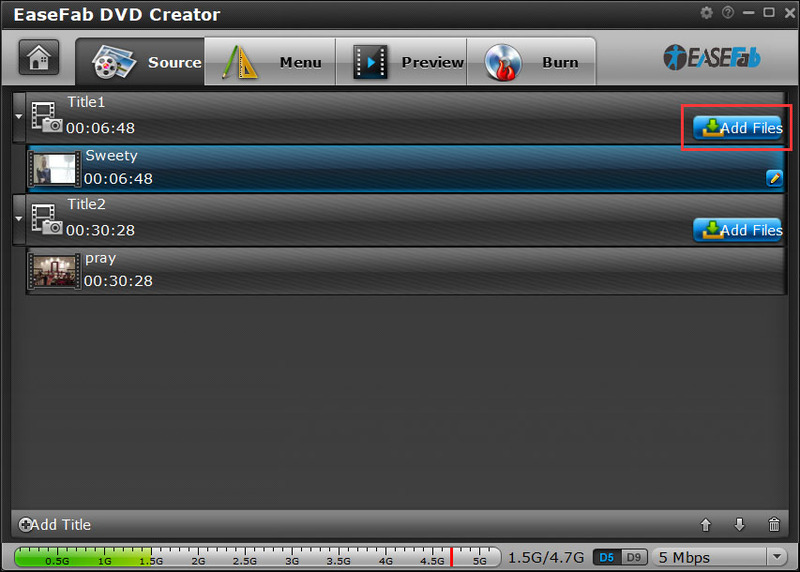 Step 3: Select DVD template and customize DVD settings before MP4 to DVD. To use a preset menu template from DVD Creator, simply double-click on the template. When/if you don't need DVD menu, use "No Menu" from Menu Templates area. To customize an object, you have to select it first. Cut over in the Menu Structure area to select the page that you'd like to custom. Custom includes changing the DVD menu template/style, menu text, display aspect ratio and background for the DVD menu. You can also set chapter mark, and playback mode. Step 4: Preview your DVD creation before you burn it. Once the menu has been decided you can preview how it will look in DVD Creator. Press "Preview" tab and your DVD video will be played just like on a DVD player. The control buttons here are corresponded with the keys on remote control. Step 5: Begin burning MP4 files to DVD. After above steps, insert a blank DVD disc to your DVD drive. Switch to "Burn" screen when you finished authoring DVD and feel like to burn created DVD-video onto a writable DVD that will play standard DVD player. DVD Creator writes content to single-layer 4.7 GB and dual layer 8.5GB DVDs. At the bottom of the main interface you can set DVD-5(D5) or DVD-9(D9) as target disc type. When burning MP4 file to DVD disc is finished, you can play it with your home DVD player and watch the video on TV.